English: Royal Standard of the Netherlands, used from 2013 to present. This vector image includes elements that have been taken or adapted from this: Royal Crown of the Netherlands (Heraldic).svg (通过 Sodacan). 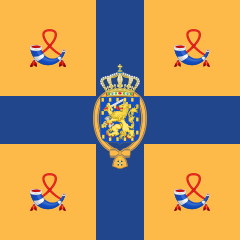 This vector image includes elements that have been taken or adapted from this: Arms of the Kingdom of the Netherlands.svg (通过 Sodacan). This vector image includes elements that have been taken or adapted from this: Arms of the Principality of Orange.svg (通过 Sodacan).